On a whim, I went to Tokyo for a week. My friends and I had been talking about a food-themed trip to the city for years, and after convincing them that now was the time to cash in all our miles, we found ourselves at the airport on a cold November day with one goal: to eat as much as humanly possible. Like me, they’d been to Tokyo before and each had a list of places to eat at. Along with our combined lists, I had received suggestions from friends, readers, and one of my favorite foodies, Mark Weins of Migrationology. Afuri Yebisu (1 Chome-1-7 Ebisu, 117 Bldg. 1F, Shibuya 150-0013, +81 3-5795-0750, afuri.com) – Tom (@tjdj311 on Instagram) recommended this for yuzu-flavored ramen. *Bifteck Kawamura Ginza (6 Chome-5-1 Ginza, Ginza MST Bldg. 8F, Chuo, 104-0061, +81 3-6252-5011, bifteck.co.jp) – At the suggestion of our hotel’s concierge, we went there in our quest for Wagyu beef. The steak basically melted in my mouth and exploded with flavor. However, I don’t think I’d go back, as I found it a bit too high-end and overpriced for me. The décor is incredible, the service over the top, and the wine list world-class — but all that is more than I needed. That said, if you want to spend money on delicious steak with out-of-this-world service, you can’t go wrong here. BrewDog Roppongi (5 Chome-3-2 Roppongi, Minato, 106-0032, +81 3-6447-4160, brewdogbar.jp) – Recommended by Matt Chandler (@mchandler07 on Twitter), this bar has 20 craft beers on tap, 10 of which are brewed on site. So if you’re tired of sake and want some fancy beer, you probably can’t go wrong here! CoCo Ichibanya (1 Chome-2-12 Nishishinjuku, Shinjuku, 160-0023, +81 3-3345-0775) – Recommended by Char (@charmatcha on Twitter), this ramen restaurant is supposed to offer hearty and filling curry as well as good chicken and pork curry in a fast service environment. I haven’t been here, but I’ve been to similar places in the past. *Genki Sushi (24-8 Udagawacho, Shibuya, 150-0042, +81 3-3461-1281, genkisushi.co.jp) – Yummy sushi, recommended by Jeremiah Cooper (@jeremiahcooperphotography on Instagram). 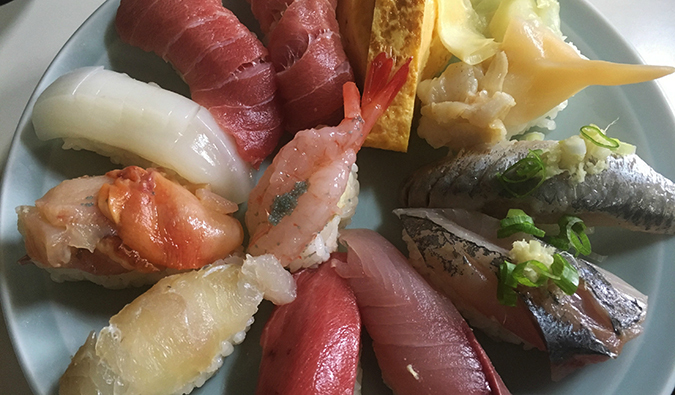 There wasn’t anything fancy about the place — it just had solid, satisfying sushi. Very attentive service too! Ginza Kagari (4 Chome-1-2 Ginza, Chuo, 104-0061, +81 3-3561-0717) – Bethany (@bjbitler on Instagram) suggests coming here for incredible chicken broth ramen. *Ichiran Shibuya (1 Chome-22-7 Jinnan, Shibuya, 150-0041, +81 3-3463-3667, en.ichiran.com/index.php) – Recommended by many people, this ramen spot served one of the best meals I had my entire trip. The thick, flavorful broth is to die for. I also like how you eat in your own little private booth. Funky. Expect a wait during peak lunch and dinner times. *Isakaya Juban (2 Chome-1-2 Azabujuban, Minato, 106-0045, +81 3-3451-6873, izakayajuban.com) – A little hole-in-the-wall izakaya restaurant (think Japanese tapas) with locals getting drunk on sake and eating tasty small plates. I was big fan of their salmon and grilled squid. They have a small English menu, but judging how my friend ordered for me, I think it doesn’t list everything, so if you see something, point at it and get it! JBS Bar (Jazz, Blues, Soul) (1 Chome-17-10 Dogenzaka, Shibuya, 150-0043, +81 3-3461-7788) – A cool bar (recommended by Anna Klebine on Facebook) that is basically a one-man shop filled with records, whiskey, and smoke. It’s tucked away on the second level of an office/shopping plaza. *Kakimaru (6 Chome-1-6 Roppongi, Minato, 106-0032, +81-3-5413-3689) – While catching up with my friend, we found this awesome place. There was an older couple next to us and a wedding party getting drunk across from us. As the night went on, the couple helped us pick food (try the speciality crab dish, it’s served in the shell and to die for), and the wedding party kept asking how we loved Japan and refilling our sake glasses, sang songs, and talked baseball. It was an amazing experience. The food is also outstanding. Be sure to get the oysters. Note: While Google Maps will list the restaurant as Kakimaru, when you go there the restaurant will be called Uohama. Kanda Matsuya (1 Chome-13 Kanda Sudacho, Chiyoda, 101-0041, +81 3-3251-1556, kanda-matsuya.jp) – Bethany (@bjbitler on Instagram) also recommended this for authentic soba noodle dishes. *Kyubey (8 Chome-7-6 Ginza, Chuo, 104-0061, +81 3-3571-6523) – Suggested by my friends, this restaurant (which has a couple of locations) offered the fanciest sushi I had in Tokyo. You sit at the bar and are served whatever the chef decides to bring (this is called omakase). It was expensive (at $150 USD) but worth every penny. Check out this video where the shrimp they served me is still moving. Masaru (1 Chome-32-2 Asakusa, Taito, 111-0032, +81 3-3841-8356) – Daina (@headedanywhere on Instagram) recommended this as an excellent option for tempura dishes. *Memory Lane (Nishi-Shinjuku, Shinjuku, +81 3-3342-1589, shinjuku-omoide.com) – On this tiny alley of yakitori joints, some require an entrance fee, but they are all worth it. I ate at about three of them, but I don’t remember any of the specific restaurant names. Mutekiya (1 Chome-17-1, Minami Ikebukuro, 1F Sakimoto Bldg., Toshima 171-0022, +81 3-3982-7656, mutekiya.com) – Carly Sabo (@carly_sabo on Instagram) recommended this spot for its amazing ramen. Honmarumen is its most popular dish. Narisawa (2 Chome-6-15 Minami Aoyama, Minato, 107-0062, +81 3-5785-0799, narisawa-yoshihiro.com) – One of the highest rated sushi restaurants in Tokyo. This was suggested to me by many people and, very sadly, I did not make it here but you probably should! I doubt it is cheap though! *Ostrea Oyster Bar and Restaurant (8 Chome-9-15 Ginza, 8F Jewelboxginza, Chuo, 104-0061, +81 3-3573-0711, ostrea.jp) – I found this while wandering Ginza, and being an oyster lover, went in for some giant oysters. Japanese oysters are big and meaty, and the ones here were no different. They also lacked a very briny, oceany taste to them (I prefer my oysters to be more sweet than salty). The restaurant doesn’t get too busy, so you won’t have a wait. Robot Restaurant (1 Chrome-7-1 Kabukicho B2f, Shinjuku, 160-0021, +81 3-3200-5500, shinjuku-robot.com) – There are a lot of weird restaurants in Tokyo, and I was sad I didn’t get to this one. Dinner comes with a show featuring robots, lasers, monsters, and dancers. It was recommended by just about everyone. Rokurinsha (1 Chome-9-1 Marunouchi, Tokyo Station Ichibangai B1F, Chiyoda, 100-0005, +81 3-3286-0166, rokurinsha.com) – Located on Tokyo Station’s “ramen road,” this tasty ramen restaurant is easily to spot: it has the longest line. I didn’t eat here as I didn’t want to wait; I went to one further down the “road” and it wasn’t super good. I mean it wasn’t bad, but it made me wish I had waited here! Shin Udon (2 Chome-20-16 Yoyogi, 1F Soma Bldg., Shibuya, 151-0053, +81 3-6276-7816, udonshin.com) – Recommended by Macaera (@macaera on Twitter), this is supposed to be great for tasty udon noodles at an affordable price. Sometaro Okonomiyaki (2 Chome-2-2 Nishiasakusa, Taito, 111-0035, +81 3-3844-9502) – Housed inside an antique building, it is well known for its okonomiyaki (a Japanese savory pancake). Recommended by Mark Wiens. *Standing Sushi Bar (1 Chome-12-12 Nishishinjuku, Kasai Bldg. 1F, Shinjuku, 160-0023, +81 3-3349-1739, uogashi-nihonichi.com) – Recommended by my other food guru Jodi, this standing sushi location is one of many in town. It’s great for a quick bite: you stand, eat sushi, and get out. It has a robust menu, so you can get anything you want, and a meal here will only set you back around 1,000 yen ($9 USD). 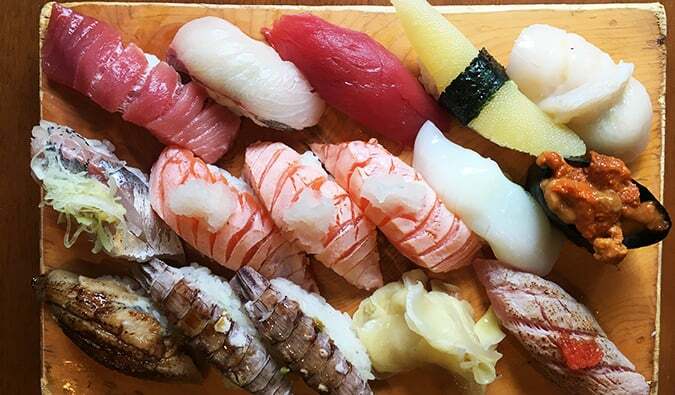 *Sushi Zanmai (11 Chome-9-4 Tsukiji, Chuo, 104-0045, +03-3541-1117) – This sushi restaurant has locations over the city. I ended up eating at the one in the fish market on one of my last days there. The fish was fresh, the servings were large, and the staff was attentive. I can’t speak for the other locations, but this one gets very crowded around lunchtime (expect a 30-minute wait). *Tenmatsu Tempura (1 Chome-8-2 Nihonbashimuromachi, Chuo, 103-0022, +81 3-3241-5840, tenmatsu.com/english.html) – The tempura here is well known for its lightness. It’s a small establishment with set tempura menus. The staff doesn’t speak great English (the clientele was mostly Japanese businessmen), but they were super friendly and accommodating, and the food is outstanding. Tonkatsu Maisen Aoyama Honten (4 Chome-8-5 Jingumae, Shibuya, 150-0001, +81 120-428-485, mai-sen.com/restaurant) – A legendary tonkatsu place. Allyson (@wanderwithheart on Instagram) recommended this one. Tonkatsu Tonki (1 Chome-1-2 Shimomeguro, Meguro, 153-0064, +81 3-3491-9928) – Recommended by Kimberly Ann (@kimberly_ann113 on Instagram), this restaurant specializes in pork tonkatsu. Tonkatsu Wako (1 Chome-9-1 Marunouchi, Chiyoda, 100-0005, +81 3-3214-6987, wako-group.co.jp/shop/detail/3147) – This restaurant reputedly makes the best tonkatsu in town. Megan (@megameg71 on Instagram) suggested it; put her recommendation to the test. Sushi Dai (5 Chome-2-1 Tsukiji, Tsukiji Fish Market 6th Bldg., Chuo, 104-0045, +81 3-3547-6797, tsukiji-sushidai.com/shop/honkan.html) – As it is the most famous sushi spot in the market, people line up at 4am for when it opens, and wait times can last up to three hours. I hear it’s good, but frankly, in a city with so much good fish, I wouldn’t wait three hours for a meal. *Tsjukiki Dontaku (5 Chome-2-1 Tsukiji, Bldg. No. 6, Chuo, 104-0045, +81 3-3541-9408) – A few doors down from Sushi Dai, this restaurant has a great omakase (though slightly expensive at 2,500 yen ($22.40 USD)), but the service and fish were impeccable — the uni and mackerel were some of the best I had all week. And there’s hardly a wait. Tsuta Japanese Soba Noodles (1 Chome-14-1 Sugamo, Toshima, 170-0002, +81 3-3943-1007, ameblo.jp/yuki-onishi) – Another recommendation from Tom (@tjdj311 on Instagram); it has a Michelin star so the noodles are probably pretty out of this world. They also use truffle-infused ramen oil. Yakitori Ton Ton (2 Chome-1-10 Yurakucho, Chiyoda, 100-0006, +81 3-3508-9454) – This tiny stall near the railroad in Yurakucho specializes in skewered pork and chicken. Suggested by Mark Wiens. 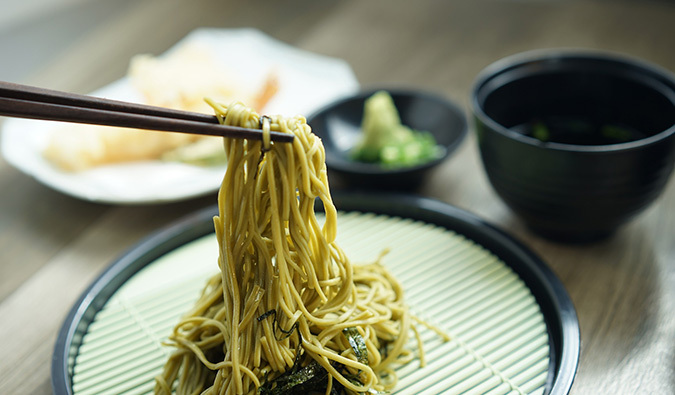 ***While I can’t vouch for every suggestion on this list, I never ate a terrible meal in Tokyo (although there were some “meh” restaurants that didn’t make the list). I suspect that it’s hard to eat a bad meal in Tokyo, where even the worst thing is ten times better than what you find back home! Thanks to everyone who gave me recommendations. And special thanks to Mark for being my Tokyo food ninja. You can check his blog for more posts on Tokyo and food in general. 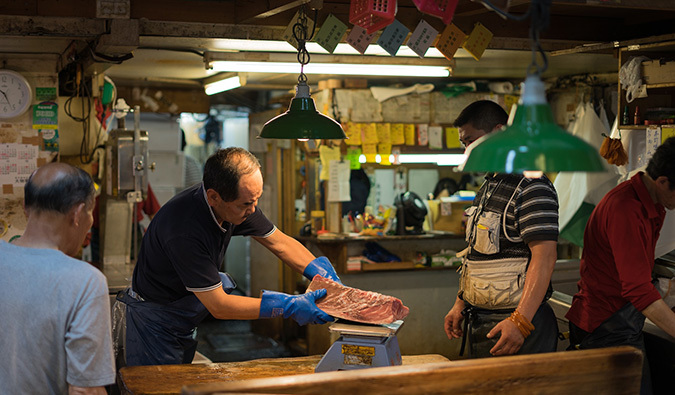 I’ve heard awesome things about the Tsukiji Fish Market. I plan on going their soon. Hopefully at the end of 2018 I can book a trip to Tokyo. you do NOT want to eat at the robot restaurant. it’s totally fun to have a drink and see the show, but the food looked like american fried fast food. totally not worth it when the japanese food you can get everywhere else in tokyo is SO good. Was it at least entertaining? I hear that’s the best part! My husband and I thought it was VERY entertaining! We skipped the meal there and ate at Teppan Baby (sit at the flat top to watch the cooks do their thing) before hand and were not disappointed – great meal! This is a great list (and I love that you crowd sourced a lot of it on social media). When we visited Japan, it was hard to know where to eat. It was one of our first international trips, and we felt somewhat intimidated by picking out a restaurant. 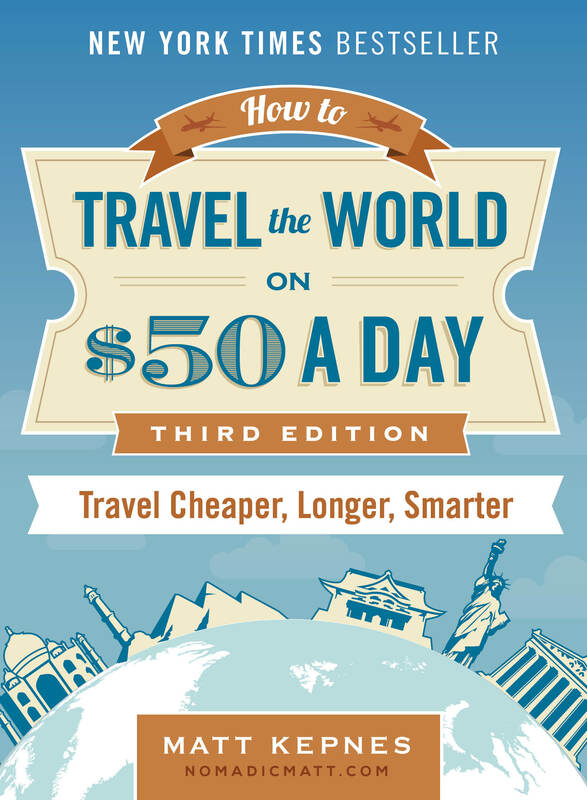 We have become much more confident travelers since that trip, so it would probably be a completely different experience now, but having a list like this would have made things SOOOO much easier! I will be in Tokyo next month for the first time and I can’t wait to try some of these places. I love good, authentic asian cuisine. It’s hard to decide which one I will visit first. Thanks for the list. I have not been to Tokyo yet Matt but goodness these look like fine eats. I did eat Kobe Beef once at Tao in NYC; closest thing to Japanese and it was pretty good. Tasty fare. I love the assembly line style set up at Japanese restaurants I see around the world; especially at a mall in Thailand. Seems pretty orderly and efficient. Whats a good expensive/inexpensive kobe beef place to eat at? Also, kid friendly would be awesome! During my year in Japan, I ventured into Tokyo a few times. Ichiran Shibuya and the Tsukiji Fish Market were standouts and I also loved all of the craft beer bars (I worked in one for a brief stretch). I read that there are over 80,000 restaurants in Tokyo and I haven’t yet been to a bad one! Loved this post! It’s given me some new ideas for my next trip here! 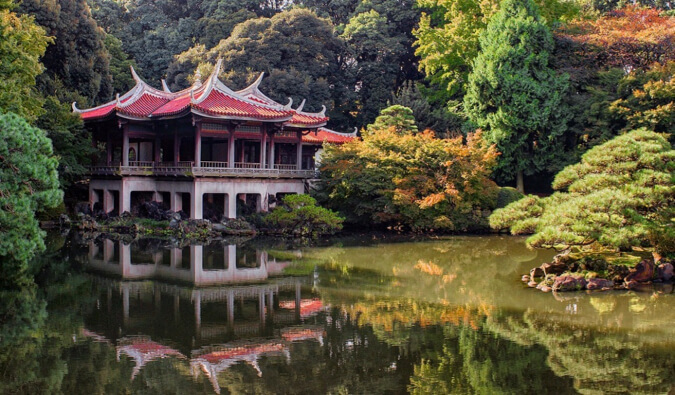 Dreaming about a vacation in Japan! Also a big fan of street food! Thank you for the list and reviews! Good to know! This is such a good list! Not enough pictures though. I LOVE looking at food longingly when I’m planning a trip! This post is making me hungry! You really can’t go wrong with the food in Japan, it’s all delicious and unique. 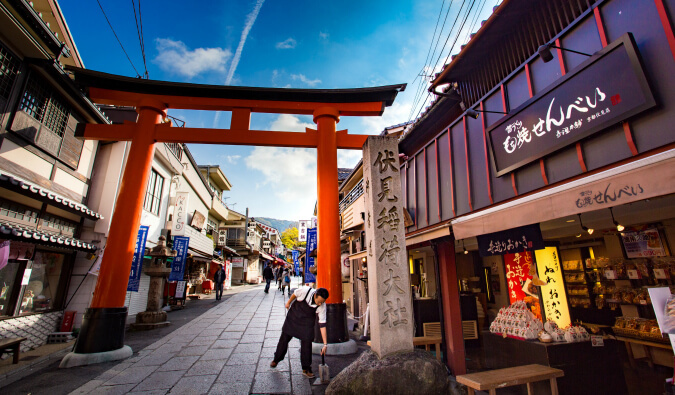 It’s also worth mentioning that the food markets in both Tokyo & Kyoto (at least) are amazing and offer small bites of all types of fish, matcha variations, other types of seafood, and are great for photos! This the thing I have been looking for, thanks Matt for this amazing share. As a business traveller, I am fed up of eating at regular hotels. I always want to get down in the streets and feed my taste buds. I have never been to Tokyo before, may this list can help me for my upcoming trips. I noticed one thing that could use an update. 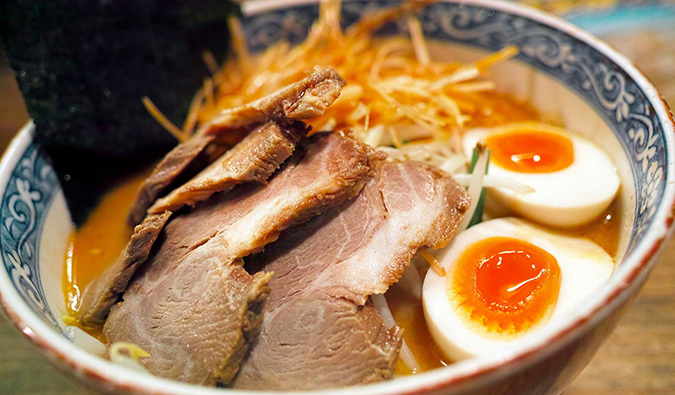 Though it’s listed as a ramen shop, CoCo Ichibanya is actually a Japanese curry restaurant. Nevertheless, it’s delicious and worth a stop if you’re traveling around Japan. It is a chain, but still good and budget friendly. Will fix! I hadn’t eaten there so I was just going off the recommendation! These restaurant was listed with no name or address? Is there either? Honestly I don’t think there is a bad place to eat in Tokyo! their approach to cooking is just so genuine and honest. Even the smallest holes in the wall still aim to give their customers the best quality they know how. Love Tokyo! I’ve been to Tokyo before and ate some excellent food, but I’ve since gone vegan. I have an upcoming trip with my girlfriend and I’m not sure where to look. Sorry, I don’t know any! Maybe someone here? Can we help Martin anyone? Matt this is a wonderful list, thank you for sharing. We are planning a trip there in April/May. Did you make reservations? If so, how far in advance and through what method (phone, internet (app vs website of restaurant)? Eating good food is one of our hobbies, especially when traveling so we want to make sure we make the most of our time when possible. Thanks! For Biftek and Kuybey we did. The rest we didn’t! thankyou for this wonderful list shared didnt know there are these much places in tokyo.I always want to try street foods but this is exciting I have been once to Tokyo before this list would be helpful when I go there this April.really excited to visit the Robot Restaurant!! Hi there! I can’t seem to locate Ginza Sushi-Dokoro Skin on Google Maps. It keeps pointing me to the Courtyard by Marriott? Is it near the hotel? Thanks! so i took your advice and i went to all those places and got to know new people and i went and ate at thse places and i loved it so thank you. This the thing I have been looking for, thanks Matt for this amazing share. As a business traveler, I am fed up of eating at regular hotels. I always want to get down in the streets and feed my taste buds. I have never been to Tokyo before, may this list can help me for my upcoming trips. Oh man, Memory Lane in Shinjuku is a blast. Great call on the restaurants around the Tsukiji Fish Market, too. 1) Don’t know how kaitenzushi (conveyor belt sushi) didn’t appear on the list. That’s my absolute favorite way to eat in Japan. It’s incredibly fun, and relatively inexpensive. 2) Robatayaki is also amazing, but unfortunately somewhat hard to find. That’s where they fire up a huge open grill, people sit around it and they serve everyone with a long, wooden spatula-like device. They serve fish, meat, veggies, even beer on the spatula. It rocks. Worth a search on YouTube to get a visual. 3) Chanko-nabe in the Ryogoku district. We went to sumo last time we were in Tokyo, and there are restaurants in the surrounding area that specialize in the Chanko stew sumo wrestlers eat. 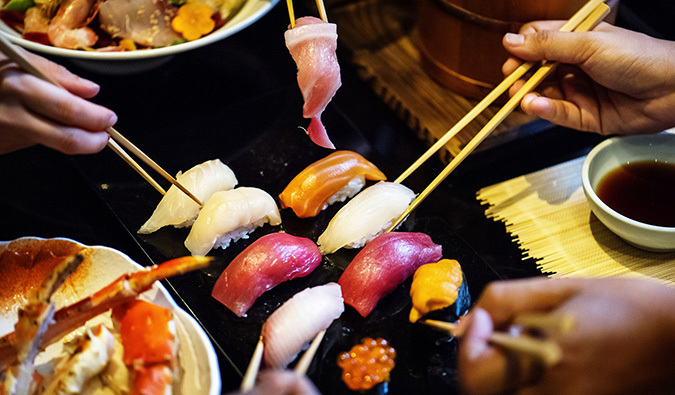 Osaka is an especially great foodie city in Japan. The Dotunburi district in particular has probably 200 amazing places to eat within about a ten minute walk under a covered veranda. Gotta try the takoyaki, but avoid the restaurant with the mechanical crab outside.